Tombs for one family only. All pyramids have 4 faces; build on the square. No mortar used. Original smooth layer limestone w/.carvings. We don't know how they were built. Speculate sand ramps used. How long take to build? Estimate 40-60 years. Saw Pharaoh as god; anything found inside? No. Robbed in ancient times. Romans used as tomb. Room at top used to fool tomb robbers. 2nd room the same-built to fool tomb robbers. But Arabs mistakenly called the 2 rooms King's & Queen's chambers. Always a tomb for 1 person or soul would be confused. Ka (soul) vs. Ba (body). Small door found-2nd door. Ventilation shafts; maybe bring air to relieve weight? Other archeologists say only for spiritual access to air. Still secrets held by the pyramids! Not built by slaves. Had no slaves then. Every family sent their best boy to build the pyramids. An honor! Boys kept for period of time & then sent back to family. We've found names of workers on list for food & beer: bread, beans, meat. We found picture of a woman who was a noble being fed by servant with inscription showing servant saying "Enough already. I've served you 19 times!" Ancient records show medical unit: doctor replaced amputated toe w/wood; man lived for 14 years w/wood toe. Tombs built in advance. Know this because found completed tombs w/no names. 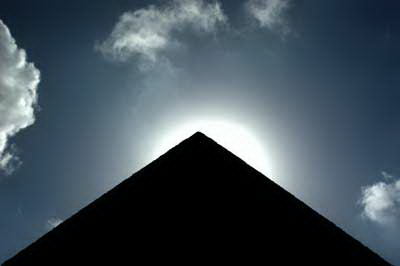 - belief all life started as island in pyramid shape so start life again from pyramid. God made man from "dirt" so we restart again. Pyramids only a fashion. Not all pharaohs had one. When they saw tomb robbers got in, they stopped building pyramids. Only built during 500 years earlier on. King Tut didn't have one. Pyramids built so soul can find body; built at edge of desert so soul can find by following line of forest to desert edge. Worshipped scarab since these bugs pushed dirt around & young emerged. Ancient Egyptians didn't realize eggs were in the dirt ball. Saw life from dirt. By King Tut's time, pyramids were already old. Records of "tourists" from King Tut's time visiting them. Mastaba=tombs of high officials & families. 2600 BC. 175 meters=Great Pyramid Height. 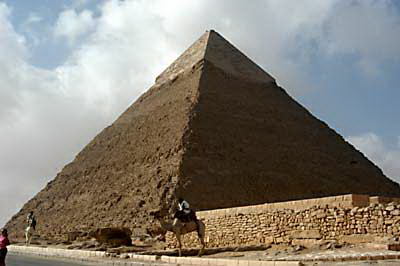 Sphinx=face of Chefron=2nd pyramid builder. Stone is older but not carving which is what makes it the Sphinx. Solar Boat=part of a great Pyramid, 2640BC; boat to take Pharaoh's soul to Heaven; original rope w/knots made from linen. No clue if boat could float but only ceremonial; no metal; found in pit; 1 stone laid over it to cover it = 12 tons. They had to move the stone to find it. 3 Pyramids @ edge of Sahara Desert that stretched for 35,000 miles. 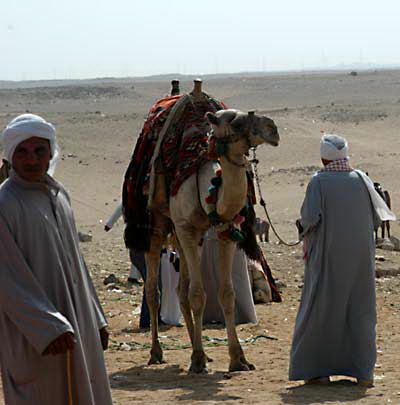 Camels not native to Egypt; brought by Arabs (from what is now Saudi Arabia) around 600 AD. Sphinx: 120 tons=head; Thutmosis IV had a "vision" & found the Sphinx=story told on dream stele located b'n the paws. Water theory by Weston not taken seriously, according to Aki; "water" marks only on 1 side. If these are really water marks, they should be on rocks on both sides so marks are probably from wind. 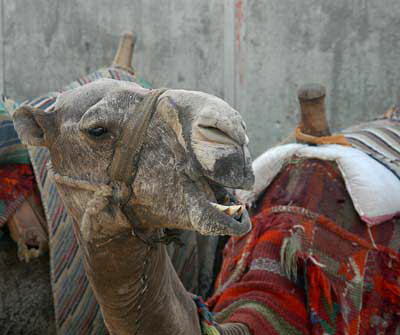 Nose damaged 9th century by Bedouins who had cannons & used for target practice. First restoration by Romans of paws. 2 chambers found but small & empty. Modern death in Egypt: body=greatest gift from God so no cremation; Family can go to any mosque for prayer; no congregations; no tombstones because we are all equal so God knows you; don't need a special mark. Next day burial as in Jewish religion. Sphinx originally carved from single stone; tiles are restoration. 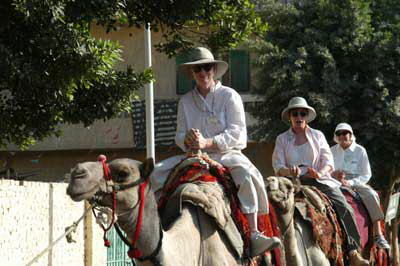 Camels: can go 7 days w/o water; fill 9 stomachs w/water before departing; they don't spit, that's llamas. They mate backwards. 1330-1993=time between quakes and devastating to steel-frame buildings. Crime is low; no bank robbers or serial killers ever in modern history. Un-opened tomb-5,000 years old found w/linen covered skeleton. Was a woman age 35. Head broken open. Dynasty 1, only, sacrificed to king. 15' deep is dig so far. 300 feet deep; maybe Seti I burial chamber-they have to remove rubble which may happen next month. 2nd tomb they're up to 25 feet deep & found wooden coffin completely sealed 5,000 years old; skeletal remains; early mummification attempts. Royal families only married sisters & daughters because they were like gods; couldn't marry "common people". Tombs show many 'chaweptas' (sp?) which are statuettes to answer questions in the afterlife. Removed water-@90 feet 4 pillars found and sarcophagus but symbols of death of Osiris. 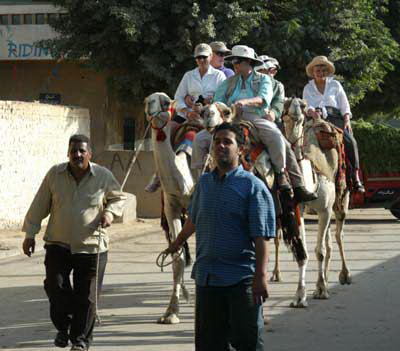 They are looking for passage to Great Pyramid. Who built the Great Pyramid? Where are the workers? 1.6million = population of workers; av. age of death 30-35. One skeleton had brain surgery & he lived 2 years afterwards. Found recipe for bread & they still eat it in Upper Egypt. They were fed meat for heavy work. 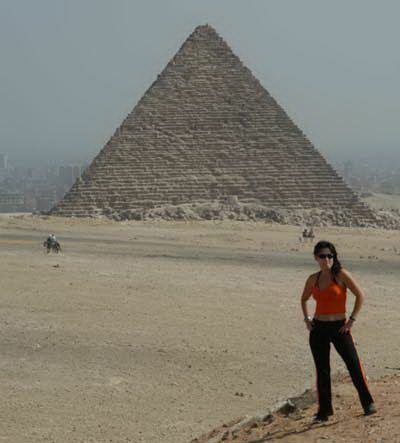 Great Pyramid: 300 feet underground; 2nd & 3rd chambers. In 1993 tried to open door but robot stopped. Then robot opened hole that led to 2nd door. 1st door has 2 copper handles to pull. Put cables in tunnel and found 3rd door w/copper handle. 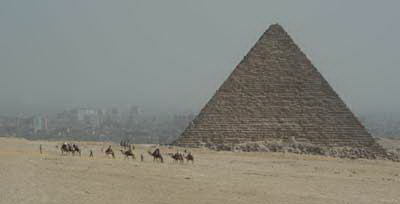 Maybe Khufu burial chamber is inside. Next October they will take robot to see what's behind doors. 100 left now and the youngest is 67. One active synagogue; 4 they can find; there were 32. Jews first left WWII-70,000 left overnight. Then in 1948 w/State of Israel more left and finally most of the rest left after the 6 Days War. And the "realist" view - the city is right next to them! French tourists doing their thing. 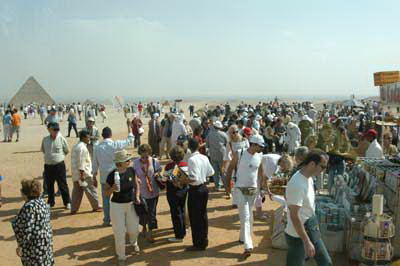 When we went to see the Sphinx, we got to walk right up to it while other tourists were kept up here. Aki has clout! You want to ride me? That evening, we went to a great restaurant, Naguib Mahfouz, named for the Nobel prize winning Egyptian author, in the Khan El-Khalili Bazaar. Here we met thse lovely native women in their traditional dress - NOT. 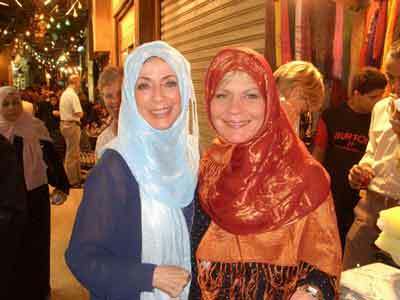 Eve and Arlene in disguise!